Most of us now preferred online than waiting a long queue and busy hotline when it comes to SSS contribution inquiry. You don’t need to go to your respective SSS building just to do inquire basic information like loan requirements, loan status, application and total contributions of your SSS account. Good thing that SSS (Social Security System) provides us fastest way to answer all our basic inquiries by using their online services at SSS.gov.ph website. We should be thankful that they offer this to public and to all members around the world. There are times that their website is undergoing server maintenance and users are having hard time accessing the website for a couple of days or weeks, still they are doing their best to put it live again for their members. Be thankful for that. To those who are experiencing difficulties on accessing SSS online, we are listing few tips that may help you get connected to SSS website. - This may not the usual case when visiting a website but we all know Google knows best. Google is no.1 search engine and indexes all the latest information available on World Wide Web. 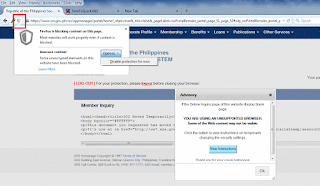 As SSS keeps updating and doing maintenance on their websites, there may be changes after that without our knowledge. By wisely going to Google.com, you get the latest indexed from SSS website. You may follow quick steps below as a sample. 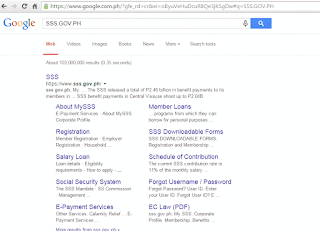 On Google search bar type “SSS.GOV.PH” then hit enter. You’ll get the first results from SSS websites including other pages as shown on image below. From that results, click on the first link with URL sss.gov.ph. 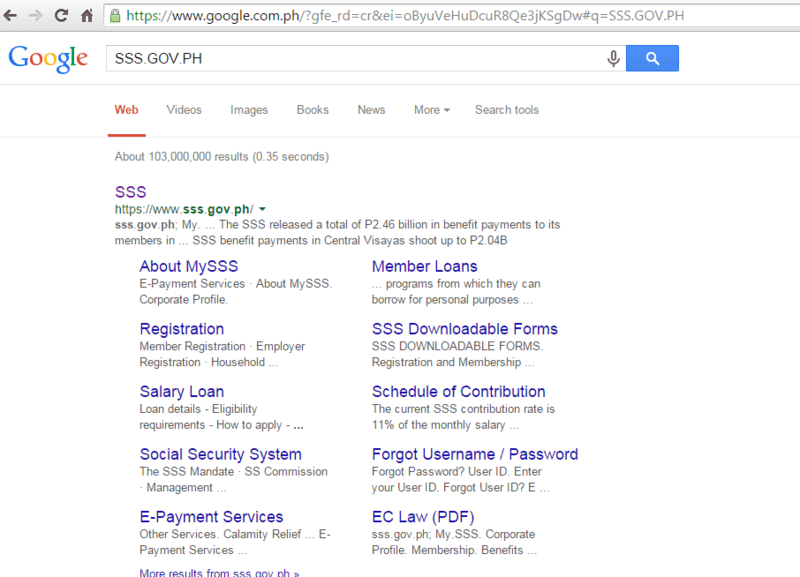 This may solve the problem to those users who directly typed sss.gov.ph on the browser address bar. This also catches new portal redirects or folder made during the last update of the website, be thankful to Google. In case SSS changes the above link, you may follow steps below. Click on shield icon located on upper left of your Firefox browser. A drop down will appear notify you that Firefox has blocked something on the page. Click on “Options” then click on “Disable protection for now”. See image below for your reference. Click on shield icon located on the upper right of your Google Chrome browser. A drop down message box will appear saying the page is trying to load some scripts. Just click on “Load unsafe scripts”. See also image below. This may solve display error below like below. This document you requested has moved temporarily. When accessing SSS website, you must have stable internet connection as there are times that SSS website response request is so slow. Stable internet may help to those whose are trying to register an account or trying to enrol SSS online access of their contribution. Though internet is not the only factor for the slow response of the website, it may help you access SSS in peak hours where thousands of users accessing the site. In case you are having trouble accessing you SSS online account with your current password and ID, you can use the “Forgot User ID or Password?” option on the website. In my experience this may hours or more before you receive your password and ID details. Note: Once you receive the User ID and password details, do not copy and paste your password to the password field. Type it correctly on password box instead of copy paste method. This may solve your problem on accessing your account after forgot password request. This may be the last option you can do in case you’re still having problems on accessing your SSS account online. That’s it guys, hope this may help you. 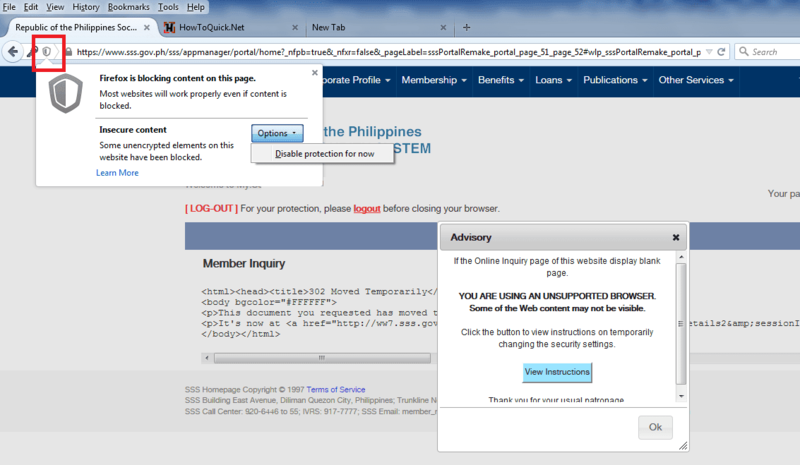 Ang bagal parin po ng SSS Website even if im using IE V11 Browser.